My husband travels frequently for work. So when he goes somewhere good (and by that I mean somewhere that has good food) I always try to tag along. This past job took him/us to NYC and Boston for 3 days each. For my husband the trip was all about work; for me it was all about the food. 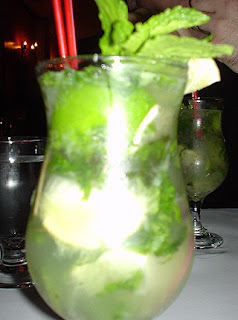 Our first night in NY we headed to Guantanamera, a Cuban restaurant near Central Park. It was 8pm on a Tuesday night and the place was hopping. There was a live band and a man hand rolling Cuban cigars for patrons to take as they left. Not at all in a rush to get back to our hotel room (we were given a smoking room by "mistake" and it smelled horrible) we ordered two mojitos and some appetizers and settled in to enjoy the music. Several mojitos, and a huge plate of fried calamari later, we ordered our entrees. 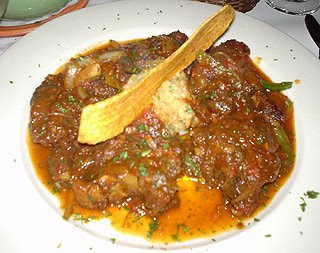 My husband got the oxtail which was braised in a red wine sauce and served with mashed sweet plantains. He said it was very tender and good. I got the sea bass. 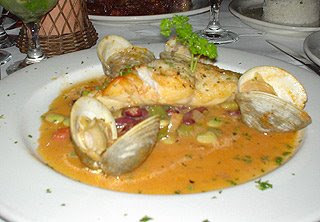 It was cooked in a light tomato sauce, served on top of a bed of fava beans and surrounded with clams. It was really fresh and delicious. The music continued on for several hours and people even started dancing. All in all it was a very enjoyable evening. Day 2 had us up and out of that horrible smelling hotel room early. We had a NY bagel and Dunkin Donuts' coffee for breakfast. It was the perfect combination. It's funny how two simple foods, bagels and coffee, can taste so good. It must be the water. The rest of the day was spent wandering around the city. We were able to catch a tour of the NY Public Library, which was awesome. I would highly recommend this tour to anyone with even a little interest in architecture and/or libraries. By late afternoon it had gotten a bit cold for our Arizona blood so we headed over to my all time favorite building in NYC, Grand Central Station . Not only is the building itself amazing but it's also a great place to people watch. So we got some cupcakes and espresso and enjoyed the scenery. We met a family friend for dinner that night at Roberto Passon. Located in Hell's kitchen this tiny one room restaurant served up some really good food. I think we were all impressed. 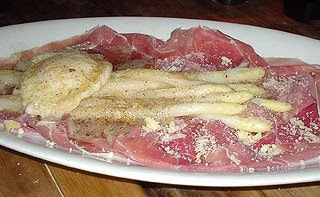 We started our meal with a delicious white asparagus and prosciutto appetizer. The meat and asparagus were drizzled in a brown butter and Parmesan sauce and topped with a poached egg. We cracked the egg and let it mix in with the rest of the dish. I thought it was a wonderful combination of flavors. Although, I'm not sure that our friend Cheryl agreed. 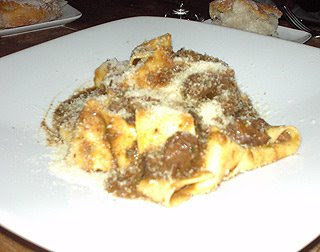 My husband choose the pappardelle with venison as his entree. Topped with fresh grated Parmesan cheese; it looked and tasted delicious. Cheryl ordered the chicken backed with prosciutto and melted cheese served over mashed potatoes. It sounds like a pretty basic dish but it was still really good and such a huge portion. I ordered the braised rabbit. I was served half a rabbit covered in olives, tomato and red pepper. All of this was sitting on a mound of creamy polenta. 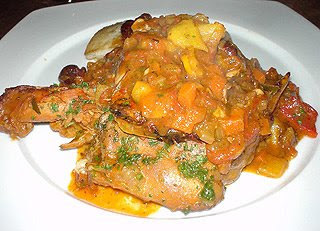 The mixture of rabbit tomato and polenta was different and good. The next day was our travel day to Boston. You can read about our food adventure here. Stay tuned for Trip Report...Part 2...Boston. Hey Hunter- Glad to see your post on NY... I'm missing home, as usual. 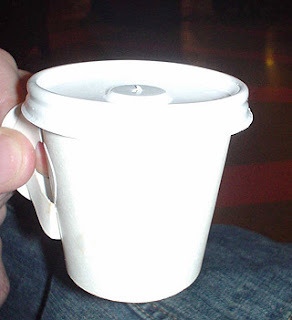 Bagel and coffee would be unbelievable right now. Sounds like you had a great time. I should be getting back sometime next month (I hope)... like you, I plan my whole trip around food... how many meals can I squeeze into the time frame of my visit?? Great stuff!! !